The contents of the book make for fascinating reading. Written at a time of great interest in the geology, flora and fauna of Orkney as a whole, it is an interesting insight into the minds of the late Victorian members. Articles include The Trap Dykes of Stromness and Neighbourhood; The Ruins of Breckness: Prehistoric and Modern; The Oyce of Firth; Manufactor of Straw Articles in Orkney; Glaciation in Orkney; Observations on Some Birds in the Mainland of Orkney; Habits of Birds frequenting Sule Skerry; The Migration of Birds as observed from Sule Skerry; A Chambered Mound near Breckness, Stromness, Orkney; and The Identification of Birds. We here reproduce one of those articles, the first in the list; The Trap Dykes of Stromness and Neighbourhood. 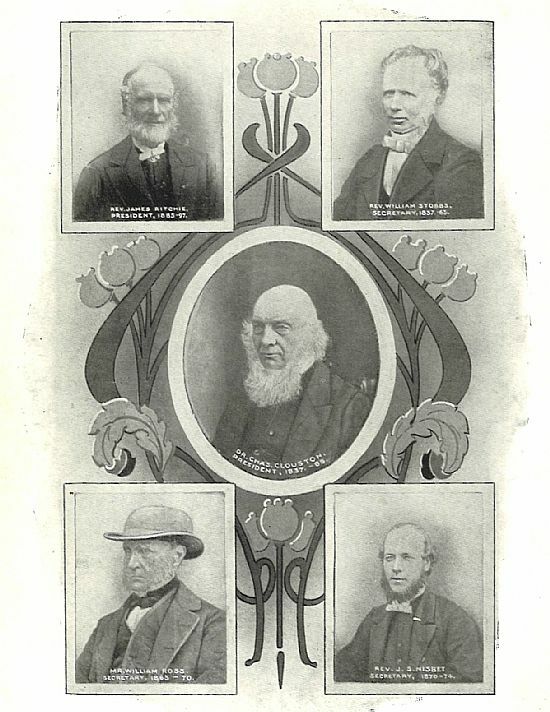 Portaits of Office Bearers from 1837-1874.